Hi Synthasite! I am having a big problem with my index page! I was trying to put some html code onto it and then after it was put on i saved it and published it. Then when i tried opening it the page wouldn't load so i could edit it. So i was wondering if you could delete the code or somehow make my page load. I dont want to remake the page because i spent a lot of time making it. Please i need help i love synthasite! The loading problem is very likely caused by the code you pasted. We can help you with this. I've attached a screenshot of what I see. Please let me know if you see something different? Wow, nice website! Anyway let back to this question. I know what is happening. The thing is problem from HTML, not Yola. Some of my HTML also doesn't worked at all. It's blank. Ok Monique thank you i'll do it right now! Hello Monique! It still doesn't load. Any suggestions? Have you had an email from the support team? I cant get the pages I have created to load... or they partially load, but not enough to edit them. Its not my browser and I have no problems at all loading any other site I usually go to... just Yola. Bit pissed off seeing as I just paid for the template and now I cant do anything else to it. * Check that you are using an updated version of Flash, click on this link. * Try loading the site in a different browser (eg. Firefox, Safari, Internet Explorer). If none of these suggestions solves your problem, please let me know. It would also be helpful if you could please share your site URL so that we may take a look at your site and see if there's anything going on. I also have this problem. I have gone through all of your steps and all is set up accordingly. Still nothing, so I find myself here trying to get satisfaction. A few years ago I added an html of a widget (which is now the myspace widget) to my Yola WEBpages. It seems that the twitter html has gone bad and I am also trying to get some satisfaction from them at the moment as well. This has frozen all of my Yola pages and I am no longer able to open each page for editing. This is mainly caused by adding invalid HTML code to your page. When this happens the page is not editable and therefore does not allow you to correct the code. This situation is rather unfortunate and your only option is to delete the page and recreate it. Invalid HTML causes very similar problems to text pasted directly from MS Word. 1. Create a "test site" in your Yola account. 2. Before adding the HTML code to your site, simply test it out on the "test site" first. 3. Add the code, save the page, open a different page and then return to the page with the pasted code. 4. If the code stops the page from loading or if you encounter any problems on the page, I would suggest not adding code to your site until it is corrected." This prompted me to find the 'bad' twitter code again so I could test it on my test page. Yep - Thats it alright - page stuck on "opening page"
Basically this is telling me that I will have to re-create the entire page that has that particular twitter html code on it. I have many many many pages all with different codes, images, effects,videos etc etc - all with the 'bad' twitter code on it - and I am hoping,hoping, with fingers crossed, that this code will be active once again so I dont have to search for all my codes and re build. So dearest Yola, whom I love so much, there has GOT to be a way around this. Or are you telling us that even after we have done 'the right thing' by testing our codes prior to uploading, if a code just so happens to go bad after a year or so - tough luck - rebuild EVERY SINGLE PAGE that had the 'once good, but now turned bad' code on it? OMG! I hope you can help me. It would take me a whole year to rebuild what I have made. You've got an AWESOME tech team. I KNOW they will figure a way around this. I'm sorry to hear that this happened to you. I would like to see if I can salvage as much as possible for you. Would you mind sending me an email to support@yola.com, ATTN: Sanja. Thanks. The following code used for a awsome comment system called "InsenseDebate" causes it to hang. Can you tell us more about what this looks like on your page and how the page hangs. How are you implementing the code? Are you putting it in and HTML Widget or are you adding it to the Blogging area of your site? Do you receive an error message? Unfortunately, there appears to be a problem with the way IntenseDebate commenting box interacts with Yola on a webpage. It works fine if you add it to your blog section under "settings" in your blog manager. 9. Go back to site builder and drag over the HTML widget box and paste the code into the box. Then click on Done. 10. 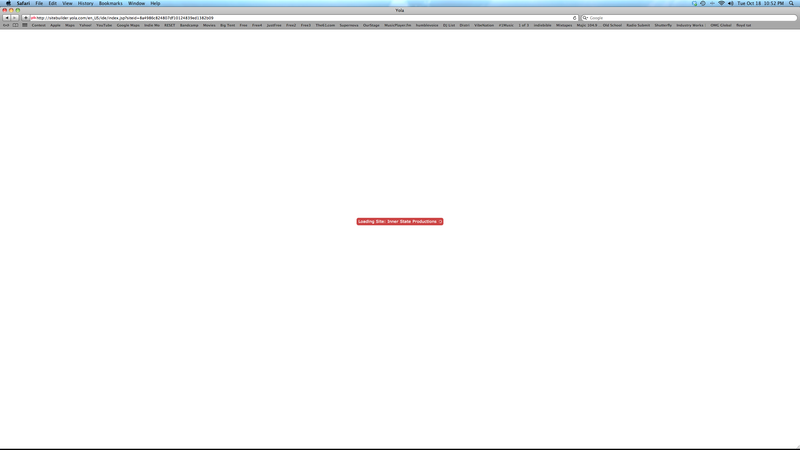 When you preview your site, you may see this message: "This page could not be reached by Disqus. If you are testing locally or on a password-protected page, please use the disqus_developer parameter as detailed here.." - please don't worry about that. You just need to update your site and you will see the comment box working on your published site. 1. First log into your Google account. If you do not have one, then you can create a free Google account here. 2. Please go the Html Comment Box. 3. In the blue box, you will need to click on "Log in" - this will give you your moderation tools. You will be taken to your Google email account. Enter your login information. Once completed you will be taken back to the Html Comment box site. 4. Please select the options you want available (which is found in the blue box). Then, copy the code you see in the green box. 5. Go to your site builder, drag over a HTML widget box and paste in the code. 6. Save and update your site. Donald.. can you please send an email to support@yola.com and we can help you from there? Please Attn it to me. Thanks. This issue can be caused by 3RD Party integrations such as Chatboxes, Widgets, Shotuboxes, Forums, Comments etc. It waits for a response from the server where your widget/integration is located at, If you receive no response from the server then it will cause it to time out. I am looking on Google for a shoutbox that has HTML integration, I find one from a 3RD party site, I put the HTML code on my site and i try to load my page. If the server of the widget is unreliable or slow then my site will not load either. If that is not the issue then maybe you have DNS issues with the widget server/Yola server. You can clear your cache in firefox by click on Tools > Clear Private Data > Check "Cache" only then press clear or by pressing CTRL + SHIFT + R at the same time on your web page. Press start (On Windows XP) or press the windows logo in the left bottom corner (Windows vista & 7) then to the right of all your programs there is a dialog named "RUN", Click it once. Then type in "cmd" in the box without quotes, then once you are in the command box which is black type "ipconfig /flushdns" without quotes and press enter then try to access your site. Command prompt notes: You cannot use CTRL+V to paste what i have told you to write in the command prompt, You have to right click in the command prompt and Press PASTE. Feel free to reply here if you have any problems during my steps. I've only recently started having problems loading site-builder. Actually, I'm have trouble moving around Yola in general. I've tried the suggestions above but still have trouble. 1. My homepage photo is large. Will this by itself cause the problem or is there a cumulative effect? I'm willing to edit most of the other photos. But I'd like to keep the homepage photo. Is this possible? 2. Is there a workaround to get into sitebuilder? If not, how can we get in to edit large photos, check for bad HTML and so forth. 1. Click on the "File Manager" button, select the image you would like to edit and click on the "Edit" button in the dialogue box of the File Manager. 3. Once Picnik's open, adjust your image to your liking. 4. When you've finished editing your picture in Picnik, click on "OK" so that the change takes effect and then click on the yellow "Save to Yola" button on the top right. 5. Your newly edited picture will replace the picture you originally uploaded. As soon as I left my post, I've been able to move around the site like lightening. I did go in and reduce the size of the homepage photo - using the same steps you listed. The photo is a little less crisp, but I guess I can live with it. Glad to hear it! We have a great tutorial that explains images a bit more: http://www.yola.com/customer-support/.... Sometimes it's better to edit the image size on your PC before uploading it to Yola and different image dimensions and pixel-size specifications can result in a different quality pic. Is this the same problem that you reported on this thread: Site is not opening. If so, I can continue helping you from this thread. I am sorry to hear you are having trouble with your blog page. Is this with your published page or page in the Sitebuilder. If you can give us a link to the page and a bit more information we can take a closer look. Thanks! Are you seeing an error message on your page? If so, can you tell us exactly what the error message says or post a screen shot here so we can take a closer look. 1. You have pasted some HTML onto your page that is not valid. This often happens if you accidentally miss a portion of the code and a tag is not closed. 2. You have copied and pasted some text from MS Word that has introduced problematic HTML or CSS. The best way to avoid this is to first copy and paste into a program like Notepad (you'll find it in the Accessories folder of your computer) This will strip out any unwanted formatting and you can then safely paste into the Text Widget. If you get a message like this, hold down the escape key until it goes away. Then try to delete any widget that you think might contain problematic HTML or text copied and pasted from MS Word. If this does not work, unfortunately you will have to rebuild the page. One thing you can do is save a copy of your pages by clicking on the drop down arrow next to the "save" button and selecting "save page as". This will give you a back up version of your page in case something goes wrong. Remember to untick the box that says "include in navigation" so that the back up page does not appear in your main navigation. My website is still down. We had our domain name pointing to our Yola site - is this simply as issue of propagation? I am very sorry that this post has gone unanswered for so long! Are you still having trouble with your domain name not working? If so, please do let us know and we'll work with you to get it resolved. I have had the same problem for 5 days with no results from customer service. I am leaving YOLA! I'm sorry to hear you are having trouble with something. If you would like to share more with us about what is happening we would be happy to assist further. Just got my website published not too long ago, and have been trying to edit. But it will not load from the index page. I've cleared cache as suggested, however this has not corrected the problem. Please help..I haven't been assisted today via the help form.Thanks. 1. Check your privacy settings. You must accept cookies from Yola. Please click on this link to find instructions for accepting cookies with your browser: Accept cookies. 4. Try loading the site on a different computer or network if possible. I've been using yola for a couple years now and everything has been great until about a week ago. The sitebuilder will not load. It just says loading but, never does. I've tried the different steps recommended to fix the problem but, no luck. I've contacted support at support@yola.com but, have only receive a generic response. Please help if you can. I'm going to switch to wix.com or somewhere else if I can't get this resolved soon. I am terribly sorry to see that no one has replied to you, Dustin. 1) Clear your browser's cache. This link has more information: Clear your browser's cache. 2) Check that you are using an updated version of Flash - click on this link. 3) Check your privacy settings in your browser. You must accept cookies from Yola. Please click on this link to find instructions for accepting cookies with your browser: Accept cookies. 5) Make sure you are using an updated version of your browser. 6) Try loading the site in a different browser (e.g., Chrome, Firefox, Safari, Internet Explorer). 7) Try loading the site on a different computer or network if possible. Again, apologies that we overlooked your replies 4 days ago - I am hopeful that these troubleshooting steps help! Thanks for the reply. Please could you share a screenshot of how your screen is performing? Because we are unable to replicate this error, it is very hard for us to provide a fix. I am hopeful we can work with you further on this. I posted a screenshot of the sitebuilder error. It just loads and loads forever. I'm not sure why it stopped working. It's been nearly 3 weeks.